Even if you need a professional to work on site speed improvements, it’s always a good idea to see what’s going on. That’s where GTMextrix comes in handy. If you’re not sure how fast your site is, this tool shows you. It can even show the speed for each page. Not sure if that PDF is dragging down your site speed? What about that big photo you posted? Now you can find out – for free. Site speed is critical to your website performance. Imagine if you and competitor had brick-and-mortar shops right next to each other. People want to enter your shop, but it takes forever for your door to swing open; meanwhile, next door, your competitor’s doors are wide open. Where will those customers go? GTMetrix analyzes your website performance and provides reports of what is working well and what could use improvement. It uses both Google PageSpeed and Yahoo! YSlow to analyze your site. Run one-off reports any time for free without signing up for an account. If you’d like to save reports for later to compare history or monitor your site’s performance, sign up for a free account. You can monitor up to 3 websites with the free version. GTMetrix will use Firefox to run these tests by default. You can also choose Chrome on desktop and Chrome on a Galaxy Nexus (Android). You can choose what kind of connection you want to simulate: 56k dialup, 2G mobile, 3G mobile, DSL, Cable, or unthrottled (default). This comes in handy if, for example, most of your website visitors are on mobile. You can test how your website performs specifically on 2G and/or 3G. You can choose where you want to test your website from: Vancouver, Dallas, Hong Kong, London, Mumbai, Sydney, or Sao Paulo. Keep in mind choosing the location physically closest to you or your server doesn’t mean it’s Internet close and isn’t necessarily important for your testing purposes. It’s good to know what you want to learn before you set up your measuring. The dashboard is slick and simple. 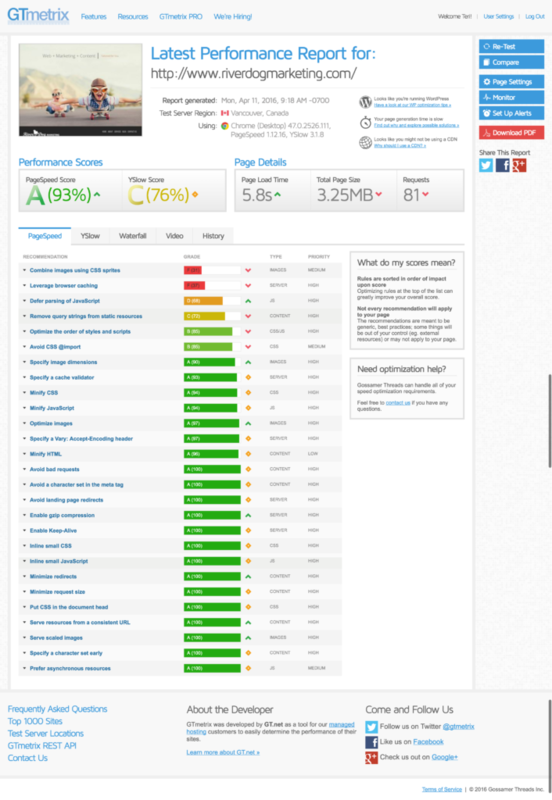 See at a glance how your site is doing overall and where the trouble spots are. Sign up for a free (or Pro) account and receive weekly digest reports or set up alerts. The history charts are helpful if you want to monitor your site’s progress as you work to improve it. A really cool feature is the video playback. You can play a video of GTMetrix loading your website to see where it is getting stuck or slowing down. It shows you from the moment DNS is resolved (i.e. when you type in your website address and press enter or when you click a link to go to your site) to when it fully loads and each step along the way. GTMetrix will give you tips on how to improve your performance. The big ones are usually: optimize WordPress (or other CMS – whatever you’re using), decrease page generation time, and use a CDN. If your website is running WordPress you can also install the GTMetrix plugin to run your reports right in your WordPress dashboard. GTMetrix also gives general advice of installing W3 Total Cache and WP Smush. Our advice is to look at your report and consider your needs. Caching is a great way to speed up your site but there are a lot of factors involved in choosing the right caching solution for your website and hosting situation. The best advice I can give you when reviewing your results is to look at what is going well (yay!) and prioritize what needs improvement. Not every recommendation will apply to your website. For example, your results may suggest using a CDN when your site is already using Photon (a CDN) for your images or it might suggest you use a CDN for some other part of your website that isn’t practical. Look over your results and see what are the easiest things you can do to make the most impact. Start there and re-test your performance. You’d be surprised what simple things can do to improve your scores and your page load time. Not sure how to read your report or what it means? Get in touch with us, we’re happy to help!